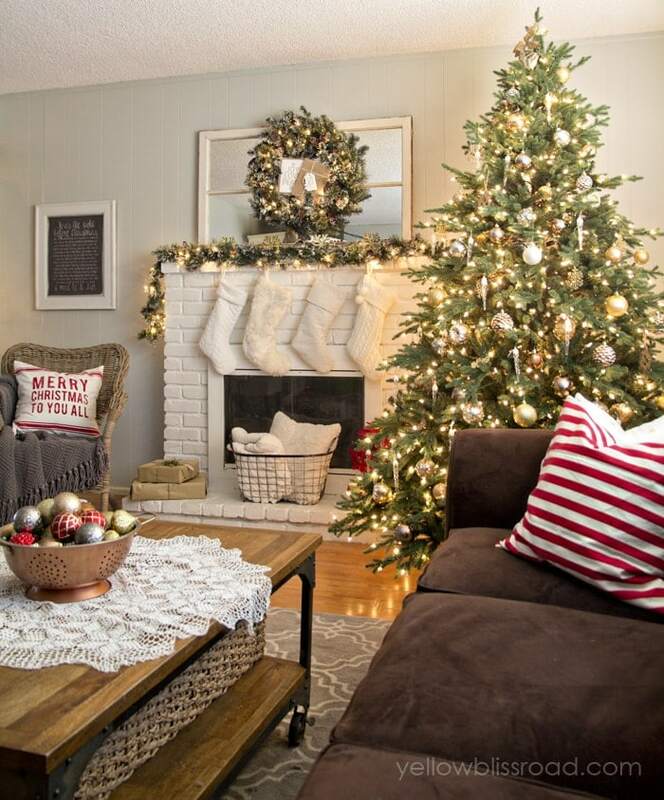 Hey everyone, welcome to my Christmas home tour! Pull up a chair, grab yourself a cup of hot cocoa and enjoy the photos. I’m going to try and keep the chit chat to a minimum (although that’s not the easiest thing for me to do!). 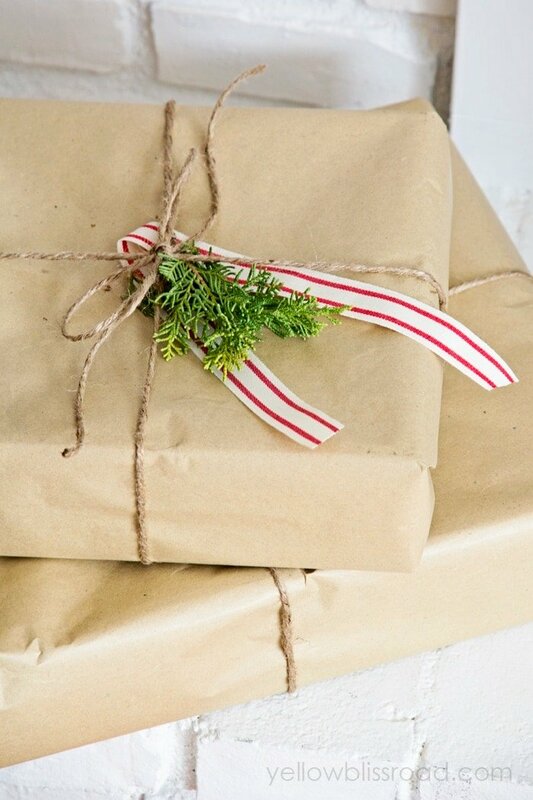 This Christmas I’ve gone a little bit glam and a little bit rustic and a little bit classic. Enjoy the tour! UPDATE – See the 2015 Tour HERE! 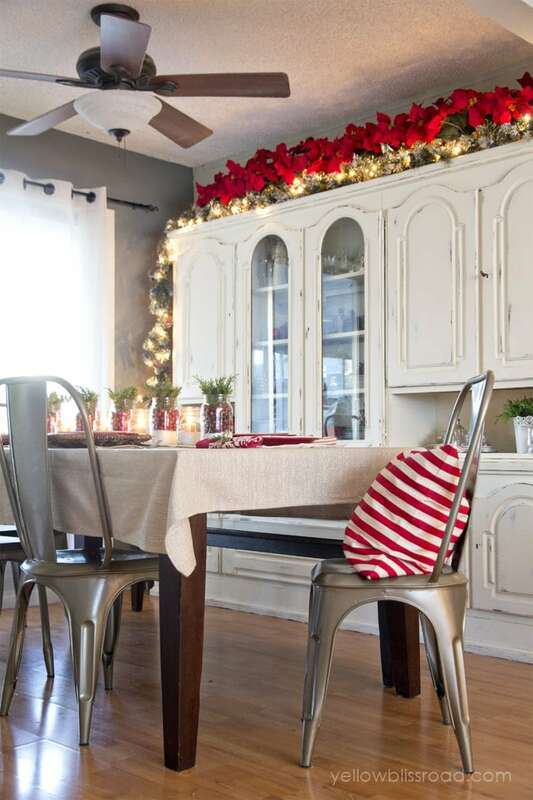 Each year I stare at my dining room table and before long I have an epiphany. It never seems to pan out though and I’m stuck playing around with it and making all kinds of changes over and over. This year wasn’t like that – I had a vision, and I managed to pull it off just as I pictured it. It’s super simple and I’m loving it. 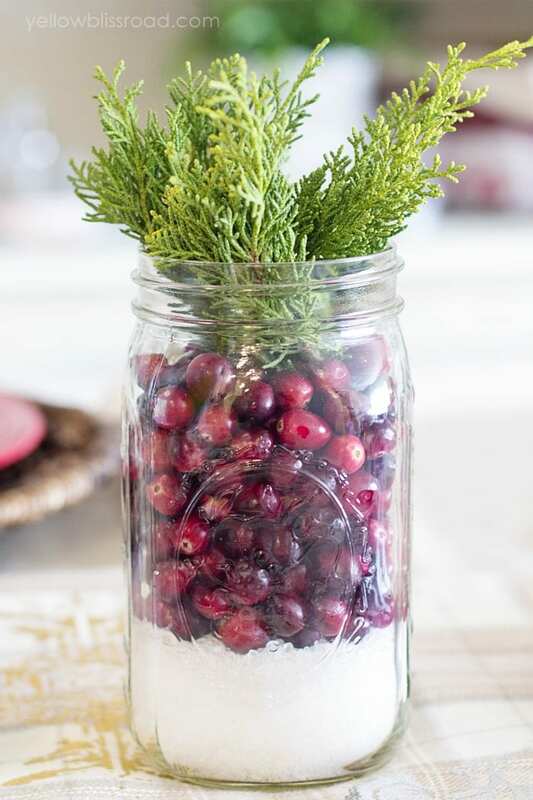 The centerpieces are my favorite – So simple, just using fresh elements like cranberries and fresh cut juniper branches from my yard. 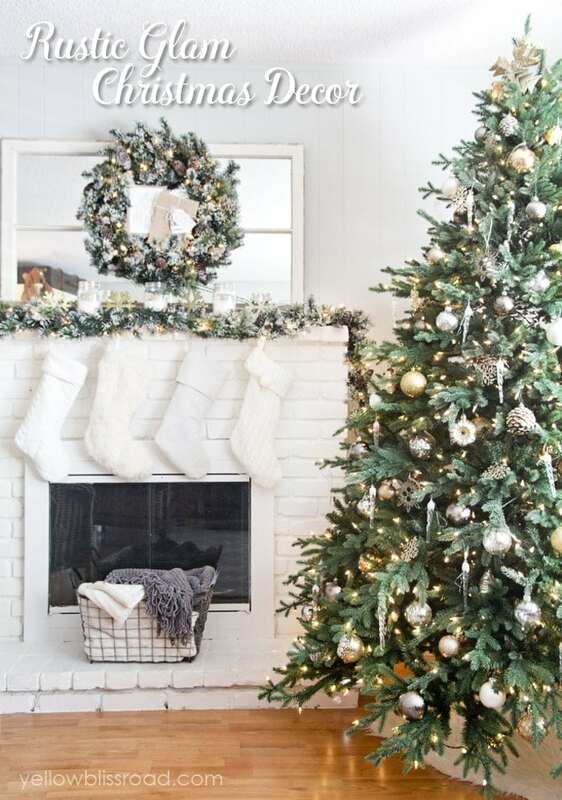 The bottom layer is just Epsom Salt, which, if you’ve seen other Christmas posts from the past few years, you know I use a lot. It’s looks so festive with them all lined up in a row! 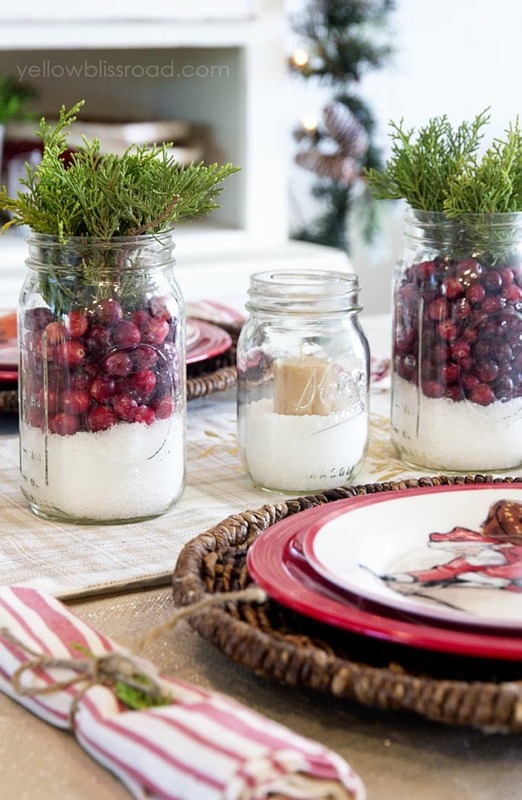 In between the cranberry jars are smaller jars with Epsom Salt and candles. I purposely bought the tan ones to offer a contrast against the white. It just looks so beautiful all lit up in the evening. 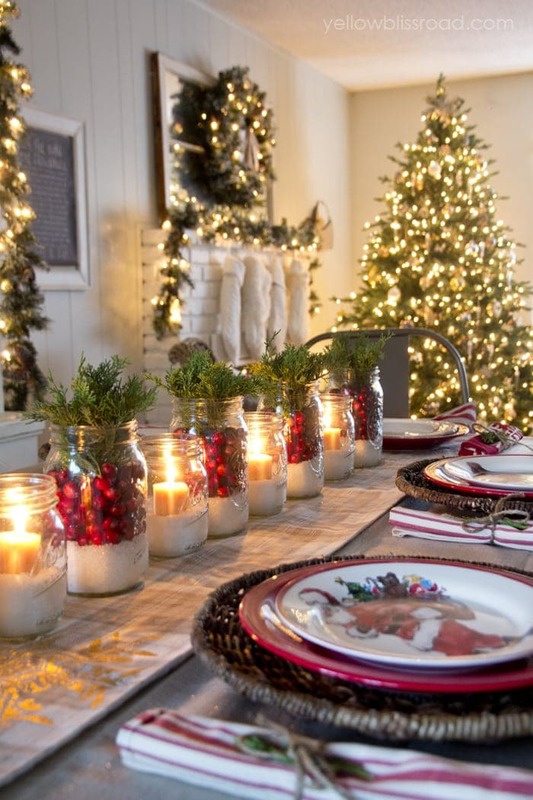 The rattan chargers are from World Market last year, and the Santa plates that I pined over for a month before finally taking the plunge and purchasing them, are from Pottery Barn. 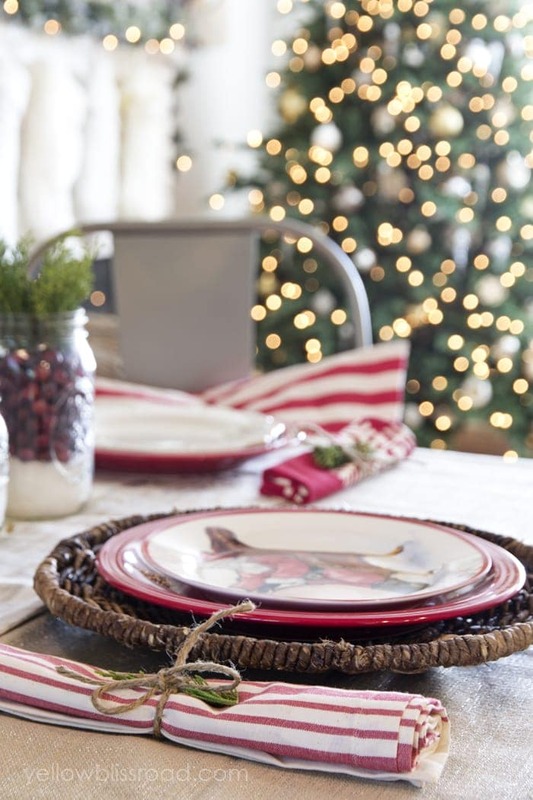 I love the juxtaposition of the rustic chargers with the classic vintage look of the plates. 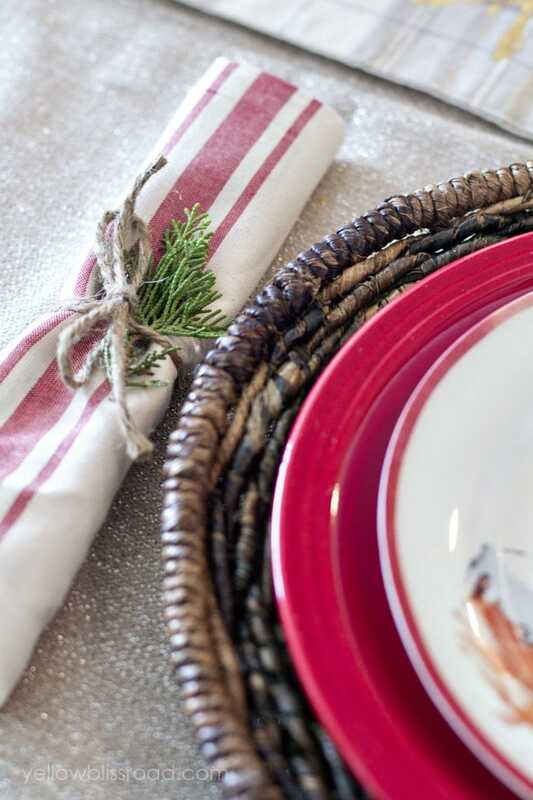 Simple twine was wrapped around the rolled up ticking stripe napkins, also from World Market. I stuck some juniper in there as well, to tie in with the centerpieces. 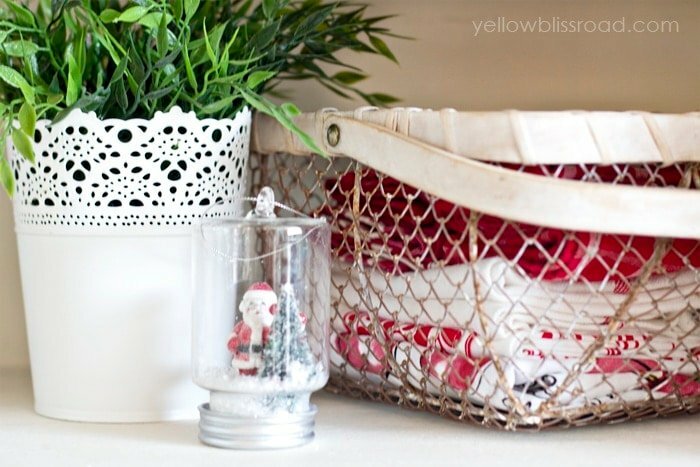 I love to add seasonal decor to my chalk painted hutch. The hutch was my grandmother’s and I painted it several years ago because I love it so much (just wasn’t loving the icky brown color!). I place my seasonal dishes and mugs, and create a few vignettes with statues and random pieces that I’ve collected over the years. 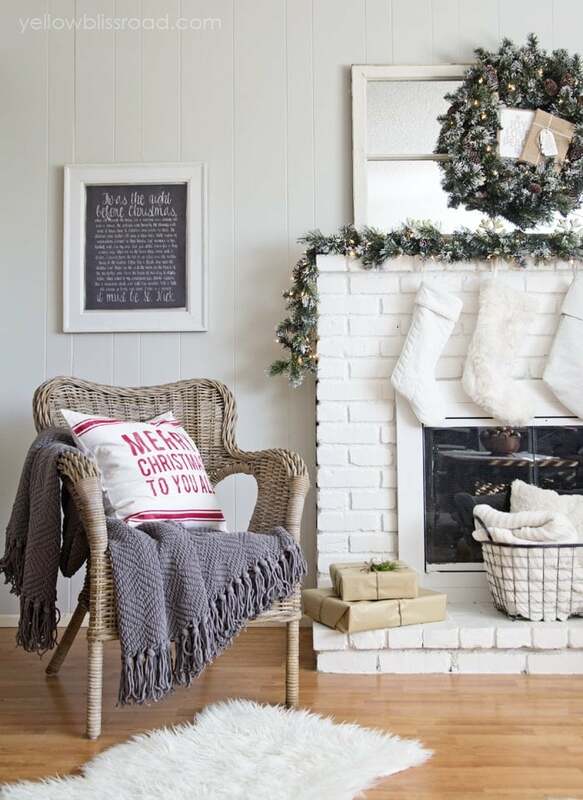 Faux pine branches line the shelves, and ornaments add a pop of color. I am in love with the red striped pillow from H & M. I can’t believe it took my until now to discover they have an online home store! Adjacent to the dining room is the living room, the gathering place, where we have our family movie nights and play board games on the floor. 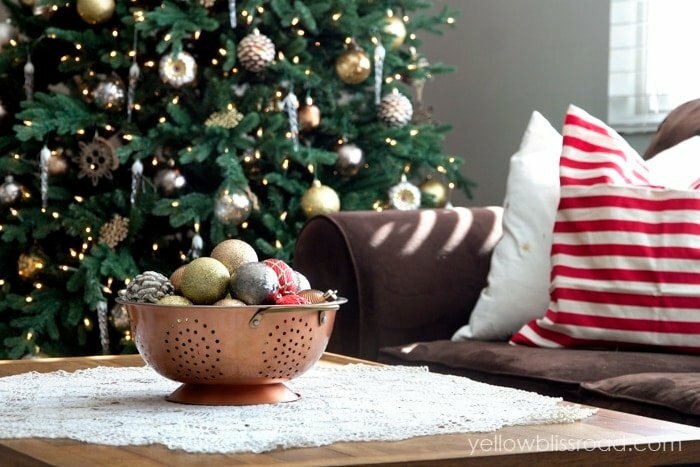 See more about my Christmas tree (that I absolutely LOVE – HERE). 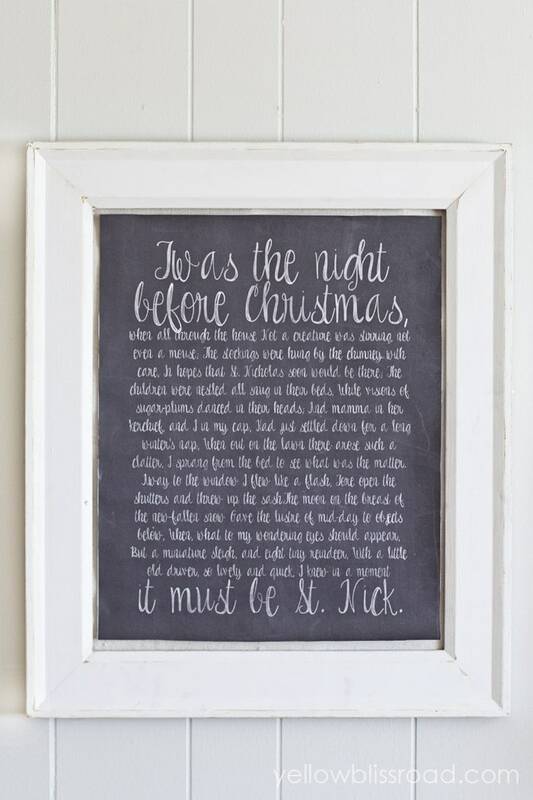 I created a chalkboard print with one of our favorite Christmas stories. I decided not to offer it as a free printable because of the potential copyright issues. My cozy wicker Ikea chair got a little cozier with the addition of my favorite gray blanket (a Goodwill Target find!) 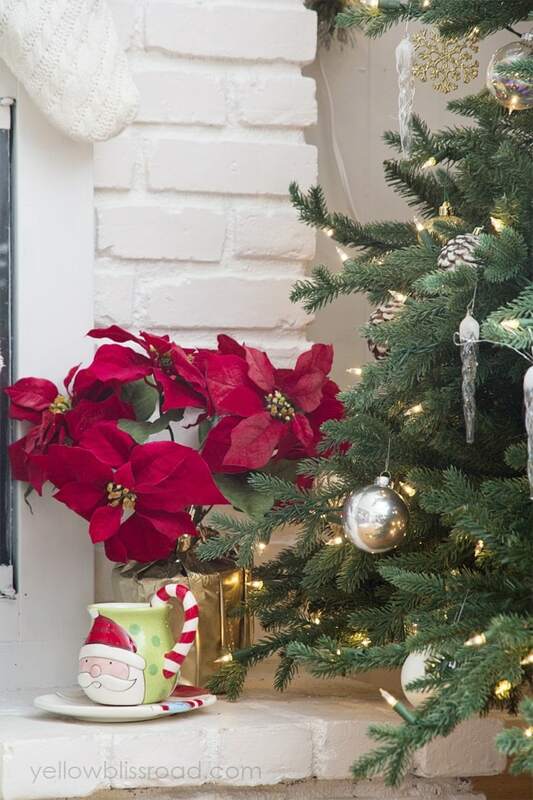 and a new pillow from H & M.
Around the fireplace I added a pop of color with one of my faux poinsettias. 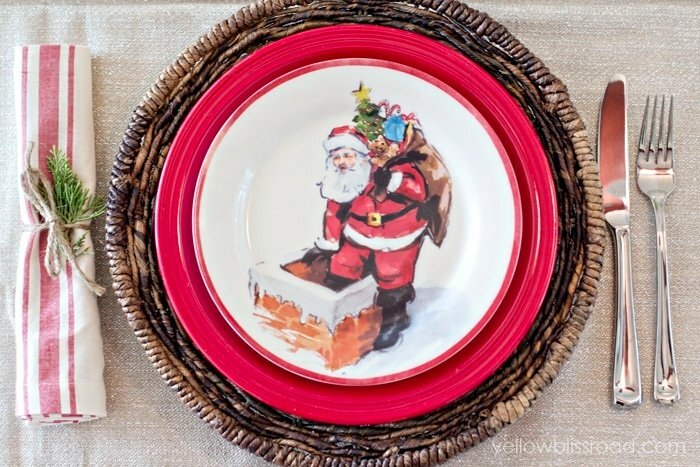 Santa’s Mug and Plate wait patiently to be filled with milk and cookies on Christmas Eve. 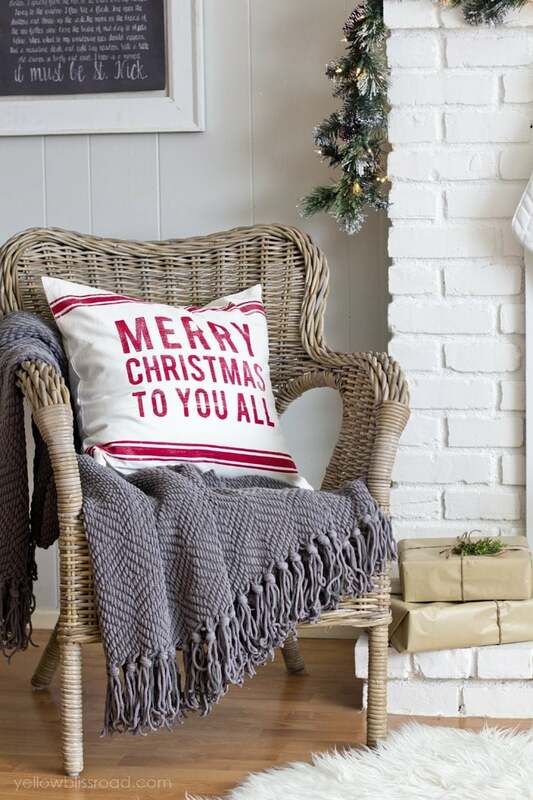 More fun pillow covers from H & M. Ornaments in the copper strainer are from the Martha Stewart line at Home Depot. Above you can see the table all set up to welcome back our Elf on the Shelf, Buddy. He visits each year right after Thanksgiving and brings all sorts of goodies. 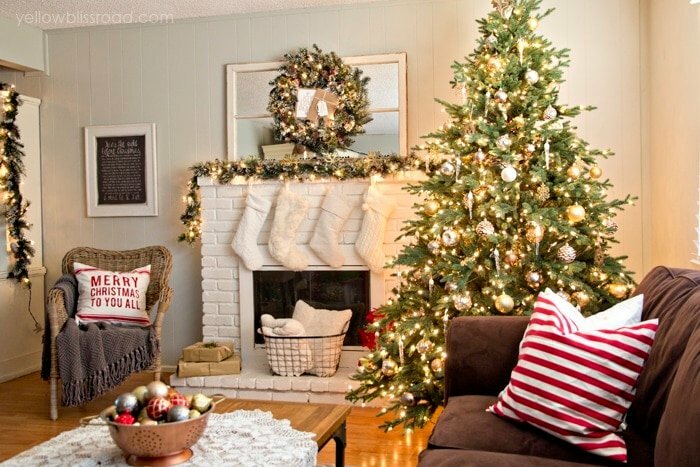 I added simple touches all around to make the space look festive. 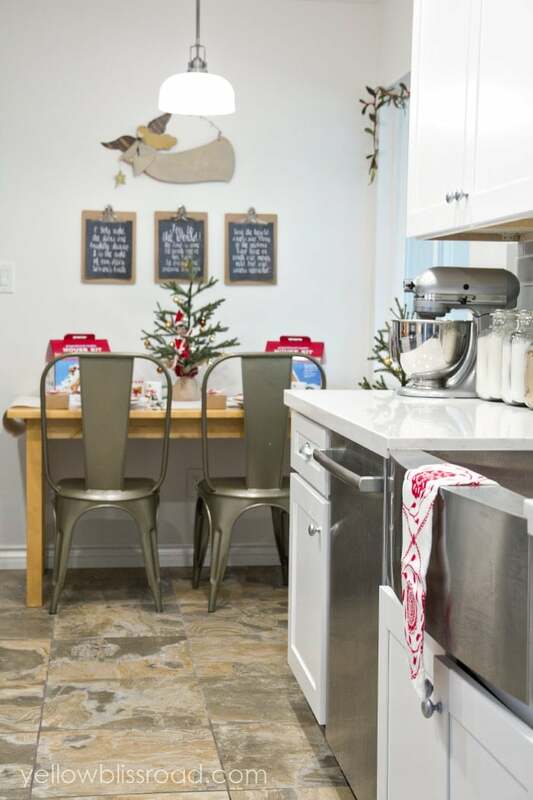 I think my cozy little snowman in the sleigh might be one of the cutest things in my kitchen. (From Pier One). Well, that’s the tour! I hope you enjoyed your stay. 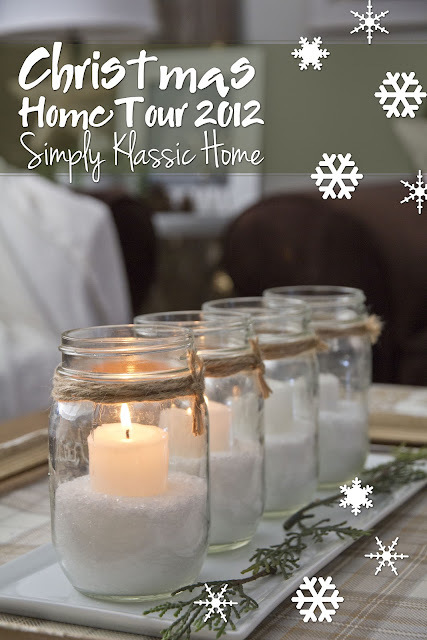 I’m joining in the fun over at Jen Rizzo’s Holiday Housewalk! 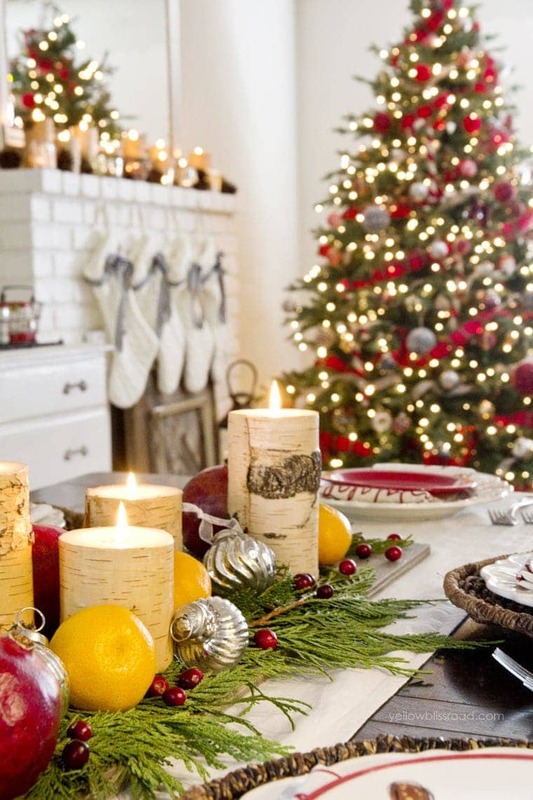 Christmas 2015 Tour is Now Live! For all Christmas posts, go HERE. Everything is beautiful! Thanks for sharing. Hi Kristin – loved your whole post and I’m borrowing the Epsom salt and fresh cranberries idea – already made the purchase! 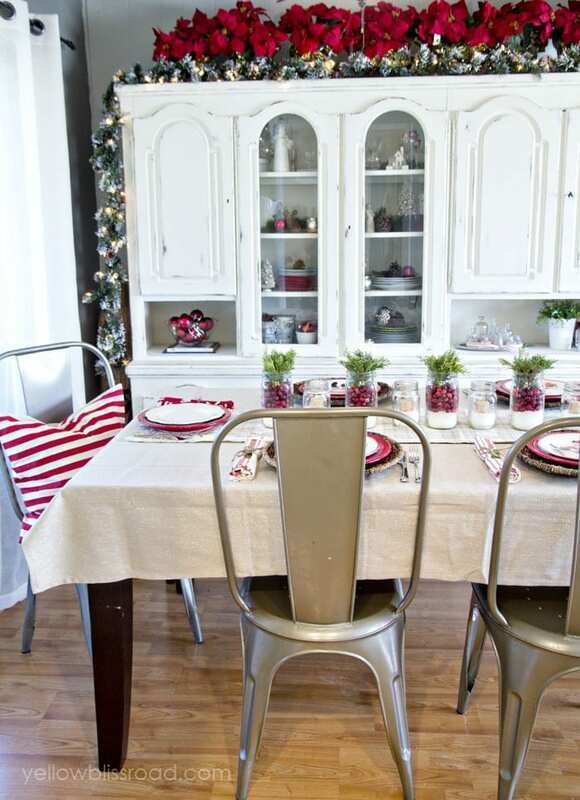 The pops of color in the china cabinet look Geat -and you did just the right amount of chit chat. Thank you for sharing your home. 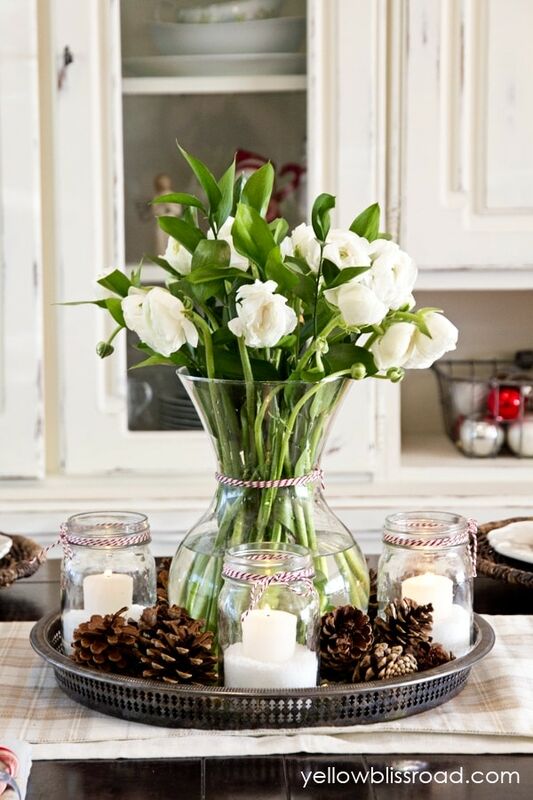 I just wanted to say your home is absolutely Beautiful ❤️❤️❤️ Love the jar idea!! Have a very very Merry Christmas ?❤️? Thanks so much Kathleen! I appreciate your kind words. Merry Christmas! LOVE the Epsom salts and cranberries! Your home is beautiful!! 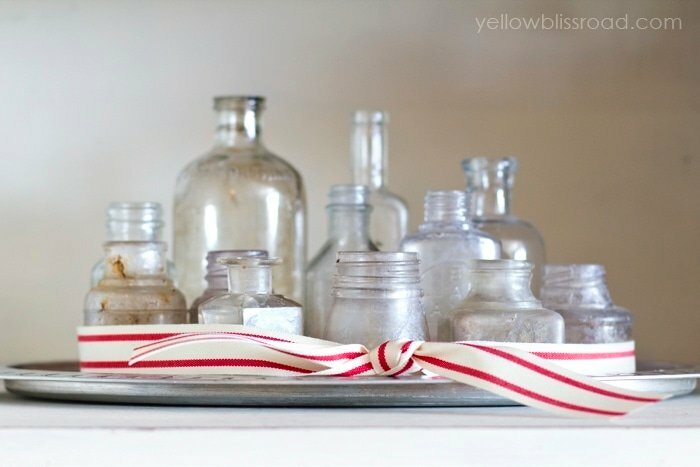 I love the mason jar ideas…and the pops of red, really accent your other décor!! Beautiful tree!! Kristin, your home looks beautiful. You have a great eye for design. I really love the way you decorated the hutch with the vignettes. You’ve given me some ideas for decorating the old butler’s pantry in my kitchen. 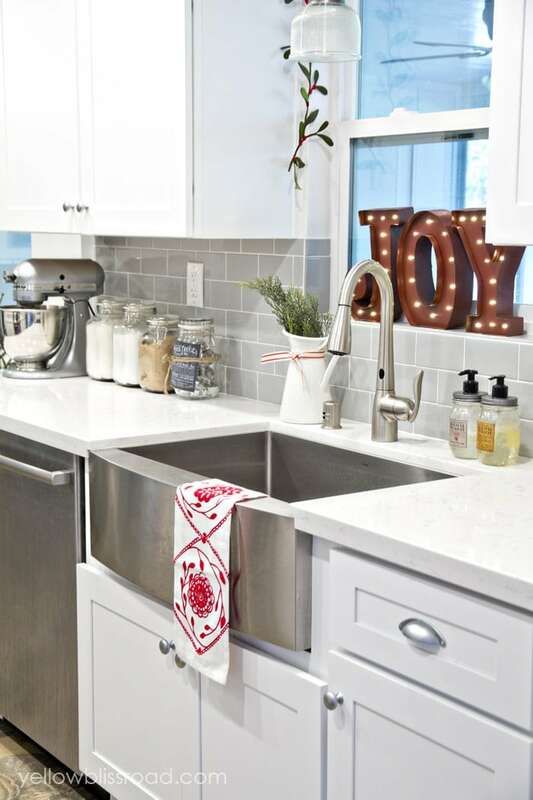 Where did you find the red and white dish towel on the stove? I believe they are from IKEA last year (2014). Where did you get your kitchen towel? Your home is adoreable! Absolutely filled with Christmas cheer! Your blog on the other hand has far too many ads and pop ups which make it very annoying to appreciate your perfect home. Hi Laurie, Thanks so much for the compliment. 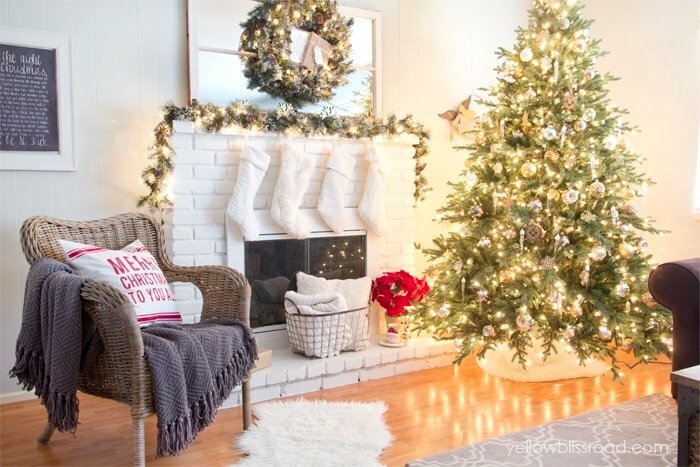 I really enjoy decorating and staging and photographing my home for the holidays so that I can share it here on the blog and inspire others. It’s wonderful to have a job that I love that’s able to provide for my family! I’m sorry you felt there were too many ads. Unfortunately, I need the ads in order to pay my bills. I’m a single mom and this is my means for supporting my family. I love being able to offer this FREE content all year long, but if I’m going to do that, I have to keep the ads. Also, there shouldn’t be any pop ups, other than an invitation to join my newsletter subscription, much like many other well known and respected sites. If there was, please feel free to screen shot it for me, as there could be a glitch in the site. Thanks, and Merry Christmas! Hi Kristen. I love your Christmas tour! You are so talented and have a great eye. I wish I could be like you! 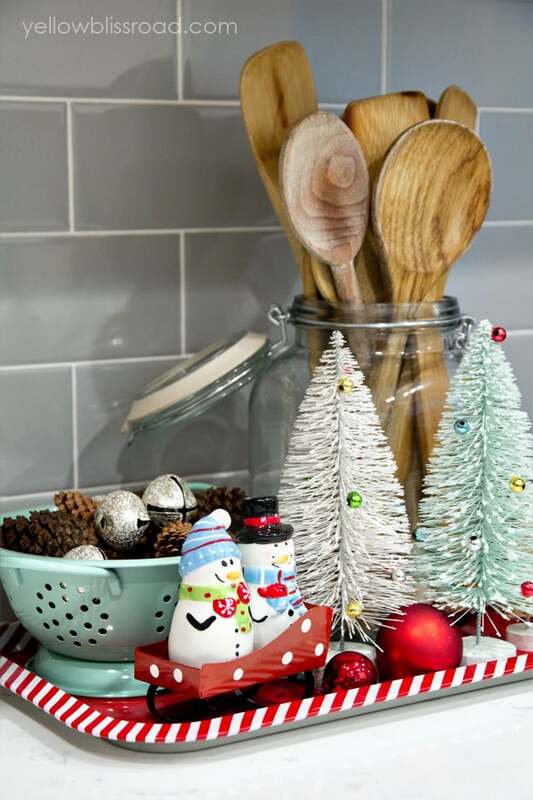 🙂 Can you please tell me where you got the red and white tray that you used in your kitchen, the one with the snowmen salt and pepper shakers sitting on in? 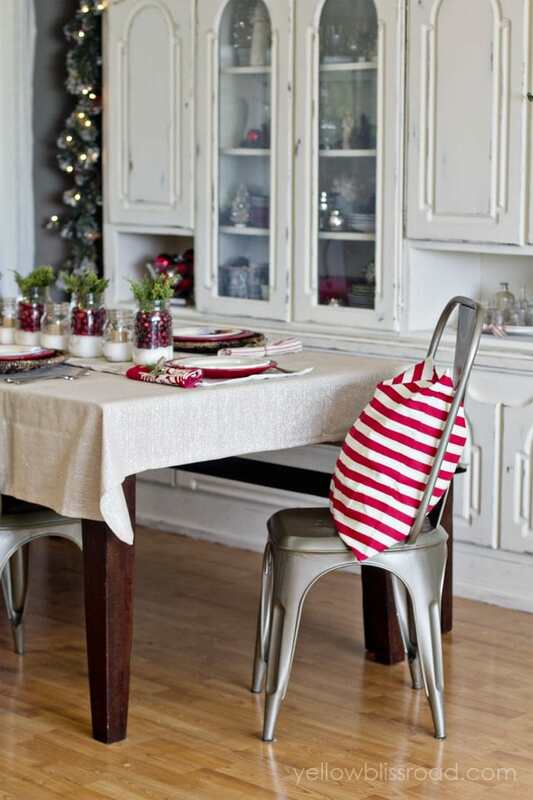 I really like that and it is the perfect size to hold all that kitchen stuff. Thanks! Thanks so much Erin! 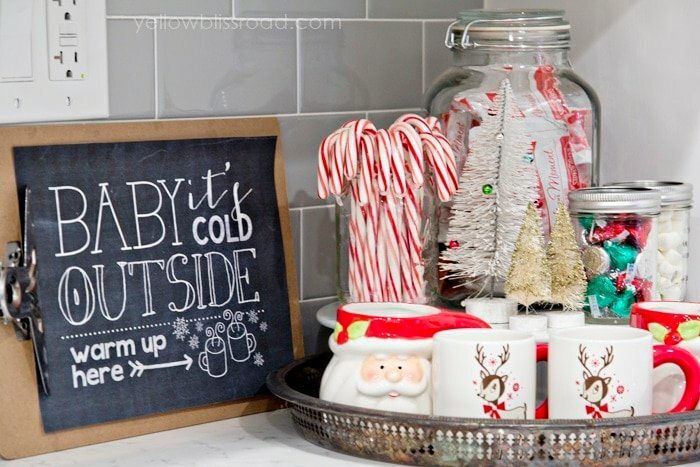 That tray was purchased last year…either at Target or World Market, maybe even Ikea. I honestly can’t remember! 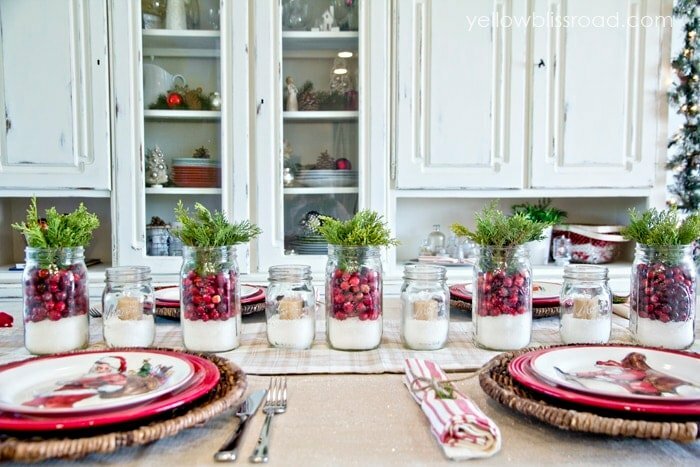 What are the sizes of the mason jars? Are they wide mouth jars? Hi, they are wide mouth quart sized jars. The smaller ones are pint sized and regular mouth. 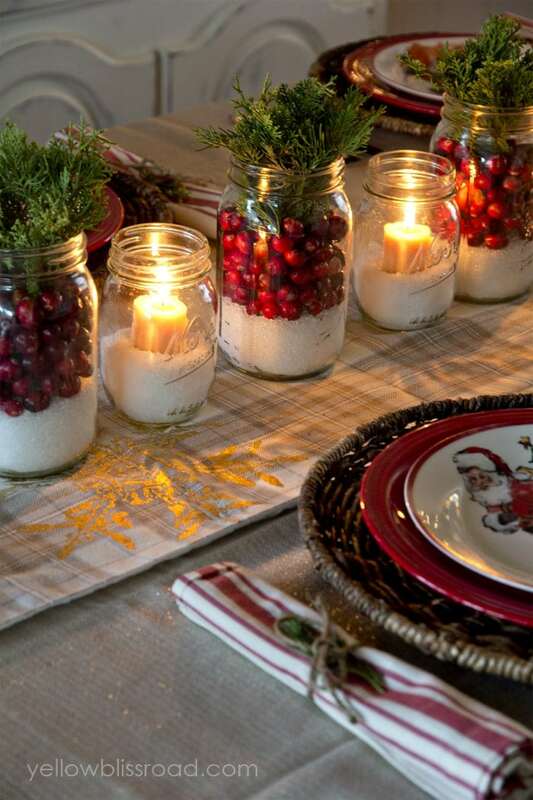 Love the cranberry center pieces…do the cranberries go bad quickly? Did you have them out for a while or just put them out for your meal, etc? I left them out for quite a while, I think at least a month. I did watch them though because some did go bad and I had to switch them out. 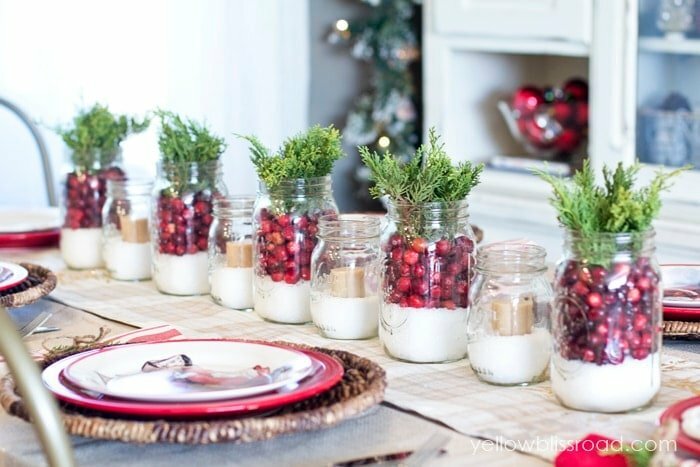 What size jars are the cranberries?